You’ve just brought your Christmas tree home. Before positioning your tree in a stand, you’ll need to make a fresh cut. Make a mark about a 1/2 inch up from the original cut at the base of the trunk. When you go to cut it, the line should be straight. Angled or V-shaped cuts can prevent the tree from getting the water it needs. Such cuts also make it difficult to position the tree in your stand. To keep your fresh-cut Christmas tree looking great all season long, pick out the right tree stand. The stand you choose should be able to hold an adequate amount of water. As a rule of thumb, the stand should hold one quart of water for every inch of the stem diameter. For example, if the stem’s diameter is five inches, the tree stand would need to hold five quarts of water. All you need to do is measure the diameter of the trunk. Also, your Christmas tree should fit in the tree stand without you having to whittle down the sides of the trunk. The outer layers of your tree are very important, as they’re responsible for taking in the most water. Keeping the trunk intact translates to a happy, healthy tree. Don’t let your tree go dry – check the water levels daily. In general, the water should not drop below the base of your tree. If it’s allowed to, dried sap can seal off the cut stump. If this happens, you’ll need to make a fresh cut. However, it’ll be much more difficult to cut the stump after you add the lights and ornaments. In addition, a well-watered tree will prevent the needles from drying and falling off. Besides being messy, a tree losing its needles won’t look as full or pretty. Water also helps keep your tree fragrant, giving off that beloved fresh pine scent. Thanks to LED Christmas lights, illuminating your fresh-cut Christmas tree is safer than ever. However, these majestic decorations still present a fire hazard. Be sure to inspect your lights before placing them on your tree. It’s also important to keep your tree away from other sources of heat. Positioning your Christmas tree away from fireplaces, heaters, heat vents and even direct sunlight helps prevent dryness. In turn, your fresh-cut Christmas tree will look and smell great from early December through the New Year. Whether you’re bringing home a fresh-cut tree or putting up an artificial one, Cape Ace has your back. 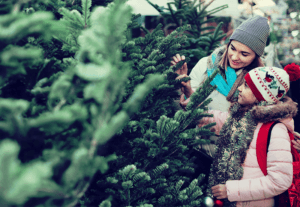 From tree stands to artificial Christmas trees, we offer a festive selection of holiday decorations that will fill your days with magic and cheer.